Pay attention while creating a focus. Collect ideas everywhere you can. Take notes and review them. Paying attention is crucial in generating ideas.The pilot slang term for that, according to Micheal Michalko, is getting tone. When a fighter pilot says “I’ve got tone” it means they have the target on radar lock. Imagine that thing you see in movies when the missile is locked on a moving object.Remember how it follows the object no matter where it goes? When the object jumps, it jumps, when the object swerves, the missile swerves. That is getting tone. Your focus must be locked to your goal securely but it is a necessity to pay attention to your experience as well. We tend to live life experiencing tremendous amount of information, scenes, and happenings that sometimes we tend to move towards life with our eyes glazed. The “looking but not seeing” syndrome. The Idea Quota Exercise is a challenge for you to work on and achieve. Be specific in what your goals are and the timeline you have to follow. If you are a writer and is planning to write a book (or not), set a quota of say, three chapters a week. If you are a photographer, aim for a shoot a week. If you are a travel junkie, aim to travel twelve times a year. If you do pottery, set a goal of producing pottery every two months. If you are a singer, make sure you sing at least three to four times a week. If you wish to be a blogger, you blog at least every other day. What is your creative pattern? What’s the difference between creative people and not? Self-perception. Creative people think they are creative and non-creative people think creativity is beyond them. When you see yourself as a source that has no creativity in the bone, you organize yourself in a way where you personally discount any creative opportunities—just by dismissing the possibilities that you may come up with something creative today. So how do you see yourself? Below are three slates. One has a squiggle, one is blank, and one has a dot. Which one are you? 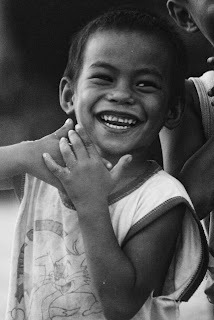 I recently attended Discover Davao Photography Workshop by Jojie Alcantara and Rhonson Ng last March 19-20. 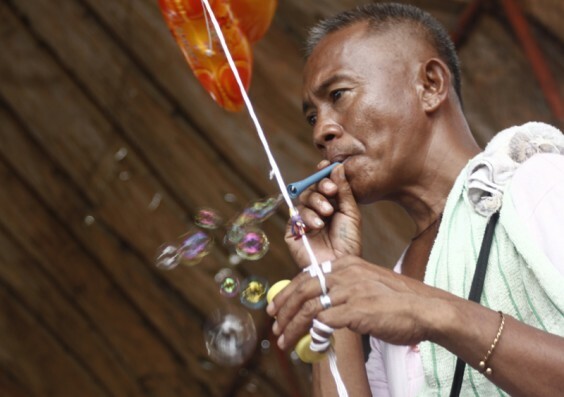 During the workshop Rhonson Ng showcased his photography works and one shot that captivated me was this photo of a person, on a sunset , blowing bubbles. I said to myself that I would get one and opportunity came when my little brother invited me– well not really invited, but rather mandated me to take photos of his son graduating in – ehem – kindergarten. Camera Club of Davao recently organized a workshop by Lito Sy in Gap Farm last Feb 5, 2010 where more than twenty photographers, including myself, were invited to attend. In this workshop, we were taught of the basic behavior and characteristics of light and how to control it in when doing a portraiture. You cannot miss them. Icons are very easy to spot in a place as they are most likely what other visitors will be taking photos of. This would be the Eiffel Tower in Paris, Angkor Wat Temple complex of Siam Reap, the Great wall of China, interesting street signs, store names, even the hump on Quasimodo’s back. Icons can be anything that shows the place’s unique identity. Look around, can you see something that you wouldn’t normally see in your hometown? Snap a photo of it. So that when you sift your photos through, you do not only see your self-portrait sipping umbrella drinks by the pool. Every hotel serves umbrella drinks, and every hotel has a pool…unless the pool water is pink, then that’s an icon too! Baseco, the land of no names. After commuting via bus, jeepney, and tricycle, I arrived at the infamous place called Baseco in Tondo, Manila. The big trucks, the crowd, even the way the shacks are placed are not foreign to me. It maybe my first time in Baseco, but it is not my first time to visit a crowded impoverished community like this. Doesn’t matter if its the first time or the nth time, places like this will always be overwhelming. It is something that one just cannot be immune to, no matter how many times one visits squatter communities. I saw half naked children playing on the side of the street oblivious to the dirt, pollution, and stench. Mothers cooking their meals outside their humble abode. Endless sari-sari stores selling junk food and drink. Gambling teenagers. Shouting fathers. Even a sleeping dog with a cigarette in his mouth! I trudged on a cement trail that probably witnessed countless evolving lives of the residents. The mute witness of the routine of the people who relentlessly fight to live their lives the way they only know how…survive. The trail seemed endless, just as the problems of these people were. Reality is merely an illusion, albeit a very persistent one. Albert Einstein 1879-1955. 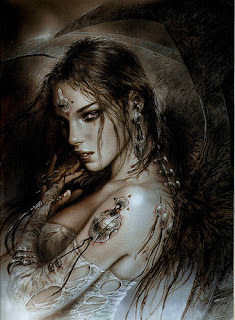 Luis Royo (born in 1954 in Olalla, Spain) is a Spanish artist, known for his darkly sensual paintings of women and mechanical life forms. He has also recently started doing sculptures of some of his earlier art. He was born in Olalla, a small town near Teruel, Spain. 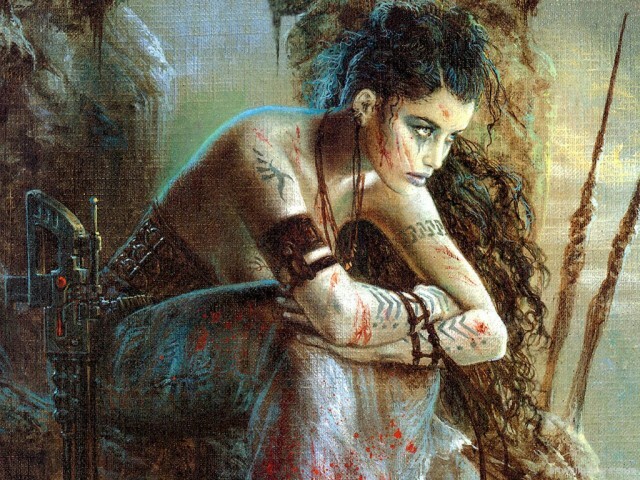 He has produced many paintings for his own books/exhibitions, and has also produced art for various other media: videogames, CD album covers, comic book covers, and Tarot cards. He is most famous for his work doing illustrations of Julie Strain for the animated movie Heavy Metal.